In 1988, “Gorillas in the Mist” was a big hit. I went with my boyfriend, now husband-Pete, and our friends, Teri and Jack. The movie is the true story of naturalist Dian Essey, protector of hunted gorillas. Blood is featured prominently throughout as gorillas are hunted for cash, gorgeous animals with huge hearts attacked for no reason, their hands sold as ash trays. Essey lived and died among these rare creatures. The last scene is especially bloody. Essey’s throat is cut. Viewers see the knife slice and blood dripping from her neck. Her assailant is never identified. As we stood up to leave the movie, I realized I could not speak. Unbeknownst to me, the movie had touched some hidden well-spring releasing a huge surge of darkness that engulfed my senses. The only two bright spots were: 1. I knew something was terribly wrong and 2. I was surrounded by supportive friends. By morning I was able to talk but dark shadows were still hovering like ghostly cobwebs in the corners of my mind. I would not wish that catatonic blackness on anyone. I understand some people can’t surface on their own towards the glimmering light of reality as I had. Trapped in that blackness for a significant period of time, I would find the experience unnerving, unbearable and ultimately unlivable. While the initial depressive episode was almost 30 years ago, I was reminded of the experience this week while visiting Wyoming friends in Colorado and Arizona. While I was in Colorado, my friends Teri and Jack drove down from Cheyenne to see me. We laughed about our many shared good times, i.e. Like when their cat, Tiger, stole the pork roast, bigger than he off the table as we were sitting done to eat. We don’t talk about how I couldn’t get to their wedding in Jackson even though Pete was the best man because I was struggling to keep the darkness at bay and wouldn’t travel for an extended period of time. I had lunch in Phoenix with my dear friend, Holly. During my mental health struggles I would camp out on Holly’s couch for the night to make sure I wasn’t alone. Excellent counseling, medication, funds to pay for it, and a strong support system of friends helped sweep my blackness away though I still watch for triggers, such as no depressing movies. I am always thankful for the light. I have been planning a spring break trip to California for my daughter and her friends to tour universities the last couple of weeks. She wants to go because her brother and his friend made the trek with my sister and I six years ago. The circumstances of that trip were very different than the one we are contemplating now. When I planned the trip in 2011, I didn’t know the challenges we would face. The week we were to leave I received a call from the friend’s father. He told me his wife had killed herself the night before while the family was in the house. I told him we would the cancel the trip but he insisted we go. Right after the mom’s funeral in a Boise Episcopal church filled with Juniors in high school, we started out to California. We wound our way down the California coast, touring Stanford, UCLA, Santa Clara and finishing in San Diego. We turned home driving through Yosemite. After the park, we drove straight home, a week away in La La land resulted in my son’s friend beginning to come to terms with his mother’s death. Understandably, he wanted to get home as quickly as possible. I was so pleased this December when my son’s friend, a first generation college graduate crossed the stage at University of Idaho. After such a tragic beginning to his college career, his success gave all of us in our family a spurt of joy. Over the years, mental health issues have grabbed more of the spotlight. The Affordable Care Act(ACA/ObamaCare) now about to be repealed requires that insurers pay for behavioral health treatment at the same level as other medical services (the technical term is parity and insurance payment for mental health is a recent development). I am an example of the success of having access to resources. Unfortunately, treatment still carries a stigma unlike cancer and too many people can’t access appropriate care either because it isn’t available or they are unwilling to admit they need help. Idaho has one of the worst community mental health systems in the nation. Our suicide rate is too high. We can strive to do better as a state. As individuals, we can all be supportive friends to those in need. My friends kept me going when I was surrounded by darkness and despair. Thirty years later whenever I’m with them I bask in their light. 1.Kangaroos are old hat, quite literally. You can buy men’s hats made from kangaroo. Kangaroo pelts are for sale everywhere. Weird tourists gifts like kangaroo balls made into flasks are on display in tourist shops. Kangaroo filet is on some menus. At the Sydney Zoo, I heard a mom shout to her child, “You don’t want to look at that—it’s just a kangaroo!” We saw only four kangaroos hopping in the wild. The one’s I saw were magical. One was as tall as my son, 6 feet 3″. He turned and glared at those of us who had jumped out of cars to watch. The animal troupe made short work of hopping across the pasture, across the road and into the bush. When we drove the outback, I expected to see lots of kangaroos and emu. We saw lots of warning signs to watch for kangaroos and we saw at least five dead ones by the side of the road. But I only spotted one kangaroo in the bush and no emus outside the zoos. As an animal advocate, I worry that all the tourist items will make the kangaroo, like so many other sought after animals of yore, into a an endangered species. 2. Koalas are as cute in person as in pictures. These fascinating creatures are said to be “punch drunk” because they sleep about 19 hours a day. We paid for pictures with them both at the Sydney Zoo which did not allow you to touch them and in the Kuranda Koala Gardens where we were allowed to hold the Koalas and feed wallabies and Kangaroos. Koala fur is not as soft as kangaroos’ hair. The only way we saw koalas in the wild was when other cars were stopped to view them. We would jump out, ask where the koalas were and people were kind enough to point them out nesting in the high tree branches. Their gray fur blends in with the bark. My old eyes weren’t good enough to spot them from the car as we drove along. The process reminded me of when bears or moose are spotted in Yellowstone National Park. Everyone pulls their cars over and jumps out to spot the animal and if possible capture them on film. 3.Visiting Australia is like falling down Alice’s proverbial rabbit hole. When we left Boise, snow was falling and the plane had to be deiced to make it off the ground. When we arrived in Sydney it was summer and 80 degrees. Christmas decorations were up everywhere we went but it never got colder than about 60. Not only were we visiting in summer, the continent was headed into fall starting in about March. We heard on several tours how gorgeous the fall colors on the trees were in late fall (beginning in March). Australia broke away from Africa over 400 million years ago. The warm climate led to the evolution of an econ-system different than anywhere else in the world. Australia is home to fabulous creatures living on the Great Barrier reef, in rivers such as platypuses and crocodiles (both fresh and sea water) to billibies to emu to wallabies, to koalas, to kangaroos (just naming a few). I had one lady on a bus who wanted to discuss deer with me because she had never seen one in the wild. I, on the other hand, wanted to discuss kangaroos. Apparently, kangaroos are like deer in Idaho. They are pretty to look at but can get in your yard and eat your flowers and trees. Australia was settled in 1788 by the British as a penal colony after the American War of Independence when the U.S. refused to take any more English convicts. As an English colony everything in Australia like England is focused on the left. You drive on the left and walk on the left. Signs are posted on the roads to remind you that you are to drive on the left. While everyone speaks English, we sometimes couldn’t understand what was being said. Australians can understand us because American movies are everywhere at the same time as they are released in the U.S. but Australians have their own unique accent which becomes more pronounced in rural areas. 4. Australia’s diverse and unique ecosystem encompasses vast expanses of mountains, rain forests, beaches and scrub bushes. Blue Mountains: During our time in Australia, we visited the Blue Mountains outside Sydney. The mountains are named for the blue mist created by oil from the Eucalyptus trees mixing with the environment. While touring the mountains, we saw a burst of white birds rise from the trees far below circle below us and disappear into the rocks. The sight was breathtaking and mystical in its beauty and silence. Great Barrier Reef: We took a tour boat to visit the Great Barrier Reef. Snorkeling the reef was the first time, I personally realized the power of the ocean. At our first snorkeling site, the crew started shouting “Current!” and throwing out ropes to the divers. When I got in the water, I could barely swim the current was pushing so strong against me. The divers used the ropes to pull themselves down to the reef. Fortunately, the other two snorkeling spots were less strenuous. The Barrier Reef is clearly suffering. There are large expanses of white or dead reef and the colors are not as gorgeous as we saw when snorkeling in November in Hawaii. There may be no reef to see in 20 years from now. Rainforests: The rainforests flourish throughout Australia’s costal areas. There is beach at the sea and a few miles in major forests where ferns weighing as much as a thousand pounds hitch a ride on the top of a tree to sunlight. Oceans, the defining boundary: Cairns was so humid my swim suit wouldn’t dry and when we reached the Great Ocean Road, the wind from the arctic was so cold one had to push into it head first to make it to the look-out stations. Along this rugged coast, the twelve apostles, large rock formations carved from limestone stand guard against the crashing waves of the ocean. Beaches in the city are jammed but the beaches near the outback are long, beautiful stretches with almost no visitors. 5.Australian cities are home to amazing architecture. Most people are familiar with the iconic Sydney Opera house, a multi-venue performing arts center at the heart of the Sydney harbor, graced with a roof of sails rising towards the sky. The Sydney Opera house is just one of many architectural symbols of Australia’s technical and creative achievements, we saw during out trip. We were more amazed and delighted by how much creative architecture is found throughout Sydney, Melbourne, and Adelaide. The buildings are multi-shaped, decorated in bright colors. Some feature art, others host glass triangles or pyramids for windows. We visited open-air malls in Melbourne and Adelaide which were full of wonderful sights, sounds and smells and gorgeous to boot. We saw elaborate winding staircases of shiny aluminum and pure wood in the universities. Seemingly weightless bridges soared over harbors and rivers. The city skylines were traversed by huge cranes building new towering edifices. Australia is a country that is growing in a vibrant, creative way we do not see in America. 6.Australia is a good place to call home. The cities have excellent infra-structure. We were able to get everywhere by mass transit which was either affordably priced or free in certain areas of the city. Some of the cities provided free wifi through the downtown but even when they didn’t, wifi was readily available whereever we went. Walking paths with lots of green spots and benches to take in the moment, clean public restrooms and facilities to fill water bottles were available everywhere tourists might be. Street concerts, modern art displays, and sporting events, including the Australia open meant something was happening all the time. The food is diverse and we found universally great. We ate everything from dumplings in China town in Sydney to hot curry Tia in Adelaide to pizza covered with greens in Robe, to salads packed with delicious nuts and berries in Cairns–all excellent and different. Our last night in Australia, my son and I treated ourselves at a high end restaurant recommended by our hotel (Blackwood) for a true Australia meal. My son is a vegetarian and had potato gnocchi and I had fish cheeks made into some type of fried cake delicacy over green beans. It was a great ending to our adventures. The cities are safe. When we were getting off the plane in Sydney, one of the American tourists said he came every year to Australia and he loved everything about it, “except the gun laws. The Australian gun laws are terrible!” This led to extremely odd looks from the Australia citizens on the plane because the gun laws are one reason Australia is so safe. Australia first introduced its gun laws following a tragic mass shooting in April 1996, The government responded by banning all rapid-fire long guns, including those that were already privately owned, and introduced strict punishments for anyone caught in possession of the weapons – including jail time. In the past 20 years, since the passage of this law there have been no mass shootings. Pay is good. My son visited a friend who he met during a semester abroad in Spain. She was working part-time as Christmas retail assistant making $55 Australian dollars an hour for retail services (holiday pay), a lofty sum in our minds. She told Scott she wouldn’t work for under $17 an hour. Health care coverage is available for all. Australia provides national health insurance to its residents but encourages higher income families to purchase private insurance by penalizing high income earners using public insurance with additional taxes. Australia is expensive to visit and to live but the high quality of public services makes up for much of this cost. Final Reflections: This trip had been on my bucket list since 1984 when I saw an exhibit about Australia at the New Orleans World Fair. Thirty-three years later, I was able to take the trip I had been planning for about half of my life. I could write on for hours about rain forests, riding on trains to the Blue Mountains, women striding through city streets in the shortest skirts and highest heals I’ve every seen, gliding through tree tops in gondolas and watching thousands of bats take flight at sun down in Cairns. But I know there is a limit to what a reader will read and I have far surpassed the usual 800 words. I had a wonderful time on a trip of a life time. I think the best recommendation for those considering a trip to Australia is I would do it again in a heartbeat even though the flight over and back is over 25 hours each way and it took me several years to save the funds to go. The blog that drew the most views (160) in 2016 was “Top 10 ways I know my son is home from college”. This high readership is either because my son is so popular his friends wanted to read about the chaos he creates when he returns home, a whirlwind on steroids would do less damage. Or there are many frustrated mothers of college-age children who read my blog and were comforted to learn that they are not the only ones spending a small fortunate on their college-bond children only to have them turn into untidy aliens who lock themselves in their room and listen to loud music late into the night. Said music seeps through the floor into my office and sanctuary, making me even more irritable than usual. The job fairy told him his first job out of college would be fascinating, with lots of challenges, great benefits and highly paid. This same mythical creature informed him that needy employers would seek him out making him adverse to filling out any applications. We live in a bold new world where talent seekers find us in the wilderness. They go out into the streets of rural America and when miraculously a new college graduate is sighted (there are very few in Idaho), they shout; “Yo! I got a good one over here.” Unfortunately, these creatures have not stopped by my house yet. Do you think it’s because we look too well off to need work? I should not be surprised possessing a bachelors degree has not changed my son’s life style. After all, fraternity houses are probably not the place to learn the social etiquette of maintaining a high end house. 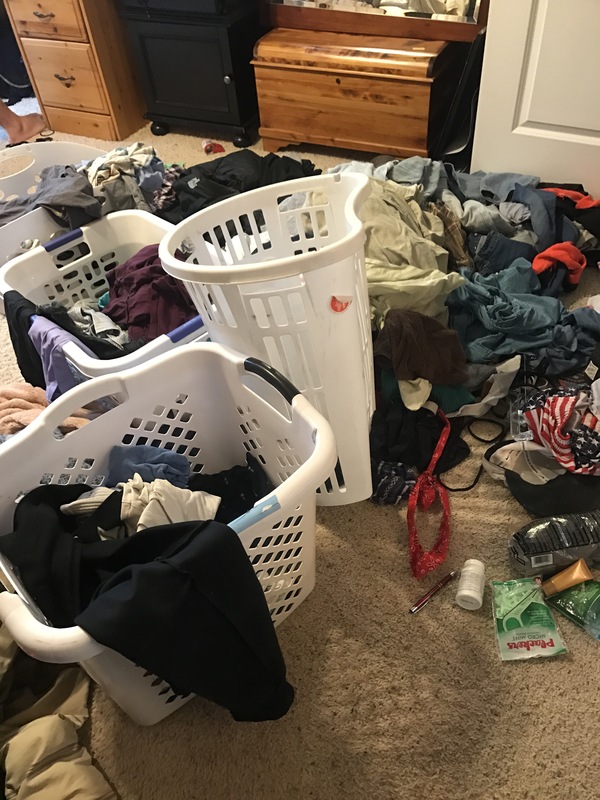 When he arrived home from school after the ski trip, he dumped everything from his many boxes on the landing floor(he noticed his possessions had levitated to the upper regions. He acted surprised, attributing the transfer of his possessions to the house wizard. (You know the one who did the entire pick up when he was about 3) He was looking for his toothbrush and deodorant, neither of which materialized in the pile of belongings the size of a mini Mount Everest. After taking a new toothbrush from our stockpile. He miraculously found his deodorant (Thank you to the arm pit gods!) properly spoofed-up to be in public, he took off to see friends again, leaving his belongings unbound. Clothes jumping out of their baskets. This havoc is done by the nasty basket troll. On Christmas day, I moved all his stuff into the guest bedroom so his sister could get to her room unencumbered. I was tired of hearing her daily status report. The day after Christmas, he left for skiing again. His refunds from taxes and his summer 409B plan are funding his activities. After skiing, he touched down in Boise to gather more friends and spent New Years snow shoeing into a yurt, exact destination unspecified since he is an adult and “on his own”. This scenario caused me to gnaw on my arm until it is bleeding, like a dog with fleas and I have a acquired a terrible pain in my neck on the right side. Meanwhile, my 70 year-old husband goes out to work every day. Am I wrong in thinking there is something askew in this description of familial bliss as we enter a new year. The first week of the New Year, he has shaved off his mustache and other facial hair revealing a new face and new attitude. He has talked to friends about living arrangements in Seattle and Boise. He has been working on a rough agenda for our trip to Australia, a graduation gift for him and a check on life’s bucket list for me. We are gone three weeks in January. The creeping clothes have managed to sidle up into his drawers and his TV has been placed on a stand on his desk, stopping the loud sounds permeating my sanctuary below. My daughter has stopped complaining about his return and gone back to lurking in her bedroom, door closed, texting friends, and reading the Harry Potter series from start to finish. Summary: All is well that ends well. Loosing 10 lbs is like dropping this cat off my waist. 10:Meeting my two personal goals for the year, writing a weekly blog and working out regularly. I managed to achieve both of these, posting 78 blogs with 2,782 views and 1639 viewers and loosing ten pounds along the way. For 2017, I have the single goal to loose 10 pounds more. I remind myself that my goal is the same as dropping my white cat Angel off my waist. 9: Growing my hair long for the first time in more than 30 years. I was able to compete with my son this summer in the man bun/mom bun contest. At a Christmas party, someone asked my sister for the name of her daughter (me). Fortunately, my sister has a good sense of humor and this made both of us laugh uproariously. My older sister, Jane, was my idol growing up and remains so today. I am three years younger than she. I have found people do view women with long hair as younger. My long hair and sister with Mrs. Claus. 8: Taking up a new hobby, paper mache which I have now renamed paper sculpture. Late summer and early fall, I made whimsical cats, dogs, and angels, a statue of Trump and a Boo-tiful Witch scarecrow all of which amuse me. Along the way I raised a few dollars for charity. In 2017, I will be developing stories for my creations and working on showcasing them better. I am planning on making cats with cowboy hats. My productions may be called “Cowgirl Ugly”. My paper mache collection, sent across America for Christmas. 7: My pets continue to amaze and amuse me. I was so thankful when Violet, my rat terrier, was returned after she was stolen this summer by a marijuana dealer from Oregon. But since her return, she has transformed again to her Devil Dog ways. I have to remind myself sometimes that I felt really, really, sad when she was gone. 6.I have volunteered helping refugees learn English and been blessed to see how much we have in America from the eyes of someone who has just gotten here. I sometimes forget that I have coats for rain, wind, snow, and fashion. My car rolls out of my warm garage when I go to tutoring while some of the people I tutor have come by an undependable public bus system in inclement weather. They always seem to be so pleased to be in America and have the chance to better themselves. 5: I have had the opportunity to travel to Mexico, Canada, Colorado, Oregon, Washington, Montana, Utah, Wyoming, Florida, Mississippi, Louisiana, and Hawaii. I always enjoy these adventures but I love to walk in the door at Ashtree Way and feel the warmth of a home filled with love and kindness. 4: I find great joy in my friends who live both in Boise and far away. In 2017, I hope to get to Colorado, Wyoming, Portland, and Arizona to see friends. My best days in retirement are when I have Bible Study, lunch, coffee, or a project scheduled with someone I hold close to my heart. 3: My son graduated from college. Living in a state where only 1 in 10 students graduate from college, it has been wonderful to have him beat the odds. 2: My family and I stayed healthy. As I age, I am glad to wake up every morning and get out of bed. I struggle with some chronic conditions, particularly my declining ability to stand for any period of time but I can still walk, swim, dance and bicycle. I enjoy any day where I am able to move in the out of doors. 1: I have had the opportunity to be married to my husband for 27 years and have a kind, smart adult son and strong-will, brilliant, beautiful 17-year-old daughter. We are an inter-racial family. My daughter was adopted as an infant from China. In a country where race has become divisive, I am pleased to let you know that it makes absolutely no difference to the heart and should make no difference in our politics. Our family loves each other fiercely through good times and bad. We have shared many small and large moments of joy this year. We never consider race to be a factor in who we are. We are simply the Robinson/Kozisek Family. But those who trust in the LORD will find new strength. They will soar high on wings like eagles. They will run and not grow weary. They will walk and not faint. Isaiah 40:31. Wednesday, December 21, is the Winter Solstice-the longest night of the year. My church celebrates the longest night to acknowledge and sooth some of the pain, sorrow; grief and darkness many of us have suffered or are currently suffering during this holiday season. For some this grief is raw, a death of someone young or in their prime, a shocking loss with no good-byes. This grief is a vise on the heart, the pain sometimes so severe breathing is difficult. There are softer but still lingering losses for others. The pain of putting down a dog who took you on walks every day and won’t be there tomorrow to greet you. The cat who slipped through your legs one night and never returned home. Some loss is hard to explain to others but still bittersweet for you; the death of the beloved ancient oak tree whose shade made your west facing backyard bearable in summer. You know you won’t live long enough to have the same shade at your house again. Or maybe the pain is just beginning because you have learned you or a loved one has some condition that will keep them from spending another Christmas with you. You celebrate shared joy today but dread the year ahead and feel the small kernel of coming loss beginning to grow deep within. My mother died 30 years ago, a week after Christmas. She suffered from a rare liver condition which both my sister and I have genetically inherited. As her liver failed her, she turned an odd sinister yellow, her face and feet bloated, her skin stretched like a balloon with too much air. When some small part of her liver was working, she knew us and except for her distorted appearance, she could joke with us and share memories of better times. But over the course of her 18 month decline, these moments of lucidity became less frequent. The poisons seeping from her non-functioning liver gave her dementia. She would think I was her mother, that my father was her daddy. Just when I would get used to the new reality of my lost mother, she would reclaim a piece of herself and know me again. On her last day, she knew everyone and told us how much she loved me. I went to a basketball game planning on moving her home in the next few days. This was before cell phones and by the time I got back to her room from the game, her bed was empty and new people were moving in. Because we are blessed (or possibly my mother would have said cursed) with financial resources, my dad and I took mom to Denver to specialists and then to Omaha to see if she was a candidate for a liver transplant. These were early days in the transplant world. We had to put up $100,000 just to be seen in Omaha. We got the funds back because she didn’t qualify. But it was a lesson to me about the differences in treatment in this country based on income. As we waited to see if mom physically qualified for the surgeries; other younger qualified liver candidates with young children waited to see if they could raise enough money in their communities through bake sales and other events, carefully orchestrated by the hospital to pay for the operation. Mom didn’t want to do anything to extend her life. She would ramble on about “wanting to go where the angels sing and the flowers bloom.” During this period she would have us read Isaiah 40:31 to her two or three times a day. We flew her home from Omaha on a private plane a few days after Christmas and she died soon after. I carry a piece of her around in my heart but her soul has flown free. In her illness, she knew more about God and spirituality than my sister, father and I combined. Sometimes, it is a gift to let go of the person you love. Extraordinary measures to keep a loved one alive are often for the family not for the one who is suffering. Thirty years ago she was lifted on the wings of eagles, soaring joyfully to sing with her beloved angels. She was just about my age. Now when I pray for those in need, I visualize them being lifted up on eagles’ wings by the Lord’s enduring spirit. As I age, my Christmas card list shrinks as friends and family pass. My father died 10 years ago, my step mother last Christmas. I grieve their passings but take joy in their memories. Volcano National Park: Plan an entire day including the round-trip drive from Kona or stay in the park at Volcano House. The active lava lake spewing red fire creates fine strands of golden fiberglass, called Pele’s Hair, after the Hawaiian goddess of volcanoes. They’re formed when lava is ejected into the air and small droplets are caught by the wind, which then cools and stretches them into very thin strands. This melted gold is breathtaking to see and touch but be careful it can cut your hand. Touring an active volcano is a good reminder that earth is always changing by forces outside human control. Be sure to take a tour with a ranger to have a better understanding of man’s relationship to nature. Before man brought predators to the islands, large birds and flora were the only inhabitants. Our ranger described how the birds became large and flightless because of the lush vegetation. Imagine a five foot tall owl greeting you as you walked the rainforest. Hawaiian Tropical Botanical Gardens (near Hilo): The flora in this garden is absolutely stunning. The pathway winds through a rain forest, past water falls to the ocean. If you are lucky, you will be caught in a rain storm providing a sense of why everything stays so green. This garden reminded me of Mother Nature gone wild with her paint brush. The number of exotic flowers and colors was astounding. When you go to the Gardens, make a quick stop by Rainbow Falls in Hilo. This is a state park, no fee and the falls are right by the parking area. Honokohau Settlement and Kaloko-Honelieh National Historical Park: This is a national park and takes either your Golden Eagle pass for entrance or $5.00 a car. Once a thriving Hawaii settlement (1200 A.D.) the park provides remnants of the past including a massive wall surrounding a long ago demolished palace, a place of worship, wood carvings of Gods and individuals re-enacting activities from the period. We saw a man in a loincloth making rock tools. We also saw live sea turtles on the beach. A short walk away is Honokohau Boat Harbor. There is only lava to sit on but the area provided the clearest blue waters and most variety of fish for snorkeling of all the places we stopped to snorkel. Akaka Falls State Park: There is a short loop walk to see amazing falls in a tropical rainforest setting. Cost of entry is $5 per car to park in the lot at Akaka Falls State Park or $1 for walk-ins (if you park on the side of the road outside of the park boundary). The 0.4-mile loop trail to the waterfalls is paved, although there are some stairs. Plummeting 442 feet, it’s easy to see why Akaka Falls is one of Hawaii’s most famous waterfalls. A viewing area includes protective railings so that you don’t fall over the edge while capturing the waterfall’s slender but powerful plunge into a gorge created by years of erosion. My kids had fun doing pictures for snap chat of the falls going into their open mouths. Waipi’o Valley Lookout: On the way to Akaka Falls stop at the Waipi’o Lookout. Take the time to view “The Valley of the Kings” at the end of the Hamakua Heritage Corridor. Once an important site for Hawaiian history and culture, it’s also a place of dramatic tropical beauty. I could feel a sacred spirit surrounding me when I viewed the gorgeous valley. Beaches: We spent three days visiting various beaches up and down the Big Island Coast line. As my son remarked, “The best beach is relative.” At one beach, there were shady trees, gentle water lapping on the shore and children building sand castles. At another we had to drive over lava in a four wheel drive vehicle and hike to a length of white sand with life guards because the surf was rough. Guide books can describe the various attributes of the beaches to you but the ones you like best will depend on what you like to do sun, surf, snorkel. The water at all of the ones we visited were glorious variations of blue and the temperature of the water warm. All Hawaiian beaches are open to the public. The government of Hawaii has done a good job of providing clean rest rooms and showers where ever practical. Kona Coffee: Kona is known for coffee and there are many places to take free coffee tours. The purpose of the tours is to sell local coffee. I found the opportunity to learn about how coffee is made very engaging. Merriman’s at Waimen pioneered Hawaii’s farm to table cuisine. Plan on eating luscious local dishes in an elegant environment. This is a high end restaurant but worth the price. Kona Pub and Brewing: A fun outside restaurant which provides good food while allowing the beer connoisseurs in your group to try out different flavors. Examples of beers are Big Wave Golden Ale, Lemongrass Luau, and Lavaman Red Ale. Prices are comparable to brew pubs on the main land. Lucy’s Taqueria, Hilo. We ate here twice because it was inexpensive, had lots of options for vegetarians (we have one in our crowd), food was served quickly and it was scrumptious. Most of all take the time to enjoy your surroundings and the people you are with. The Big Island is big, beautiful and tranquil. Don’t plan so much that all you are doing is rushing hither and yon. The Big Island, Hawaii is a land of white, black and green sand beaches, flowing lava, gorgeous flowers and rainforests. If you want to go to fancy restaurants or walk long stretches of sandy beaches with small waves choose a different Hawaiian Island. I say this from experience. We have been to Hawaii five times and visited three different islands. If you are like us and like to set out each day to explore a new locale, the Big Island is for you. We carried snorkeling gear, beach chairs and towels and boogie board with us every day. No telling when that special black rock road will lead to great snorkeling. Flip-flops are a failure on lava. Bring a good pair of hiking sandals. When headed towards the rainforest have rain gear with you. You will need it. Buckets of rain can pour down on you without warning and then disappear in a few minutes. The rain is warm but you’re still wet. The scenery is so breathtaking it’s hard to know when to stop taking pictures and just sit and soak in the view. 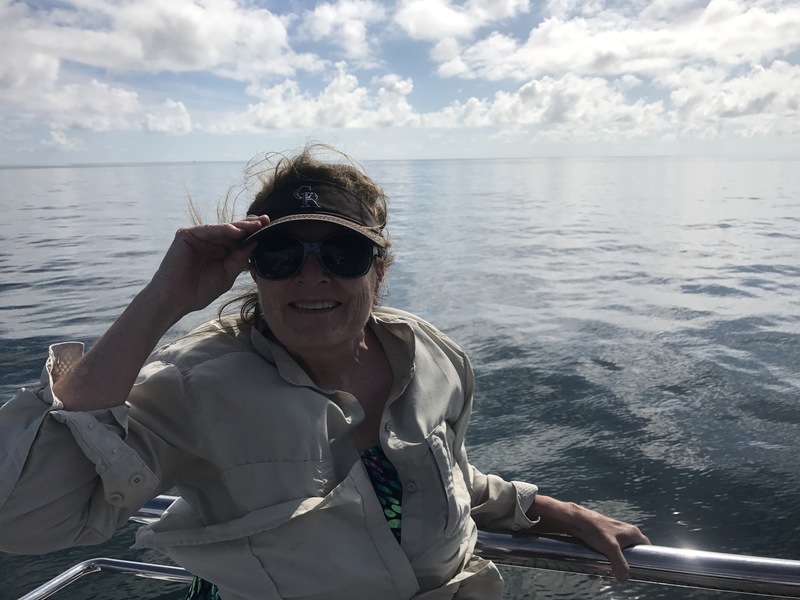 I had clothes for a week and I spent most of my time in a two piece swim suit, long-sleeved sunbrella shirt and sun visor. I burn badly so sun screen and lots of it was a must. The nights were mild. We never needed long pants except at the high elevations when we went to the Volcano National Park. The temperature dropped to the low sixties causing me to pull on my lightweight workout jacket. At the volcanoes, we wore our hiking shoes not our sandals. When looking for places to eat, we would ask our trusty friend Siri for local restaurants and then make our decision based on reviews and dollar signs. We found many unlikely places to dine off the beaten track with great local food distinct from the usual tourist fare. Of course, Kona coffee is world renown for its dark color, thick texture and strong body flavor. A daily cup helps keep the group going. Our adventure was appropriate for teenagers, young adults and active seniors. Young children would have a terrible time driving so much and many of the beaches were too rough for children to just play in the sand. For people seeking active adventure, the Big Island has so many choices the hardest thing you will do each day is decide where to go next.